Wiz Khalifa the weed loving rapper from Pittsburgh, PA is yet another music industry puppet. 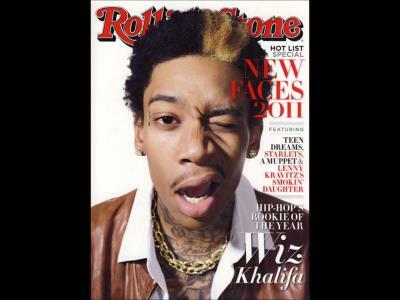 Above Wiz is seen doing the usual one eye symbolism- yawn. Also above is a still frame from his Black and Yellow music video where we see Wiz next to someone with a Satanic pentagram on his shirt - Just of like the one here: churchofsatan.com. While another guy smiles in the camera with a devil horn hand gesture. It is not a coincidence, these are carefully purposefully placed in the video. His wife Amber Rose appears as well to have signed on, she for some odd reason decided to have a temporary tattoo of an upside down cross placed on her forehead. Yes that's normal.